Reiner Henneveld's sons grew up watching and learning from their Pa in his workshop and they vividly remember him repeating this motto. It didn't mean much to two young boys at the time but what a difference a generation makes. Reiner's Original rhino's offer an intelligent design to the average household. The endangered African species can now be brought into the homes of those who are interested in culture, animals, or merely for design. 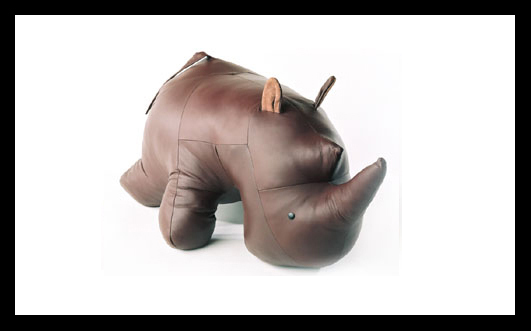 Reiner's Original Rhinos are made from 100% quality upholstery leather and stuffed with acrylic, polyester and mixed fibers. Rhinos are available in eight classic colours: black, navy, burgundy, chocolate brown, beige, ivory, grey and multi-colour patch. They are handcrafted in our workshop, located in Kitchener, Ontario, and delivered directly to you. Posted on August 12, 2014 by Lory MacDonald.